Very rarely do I refer to something as a masterpiece. 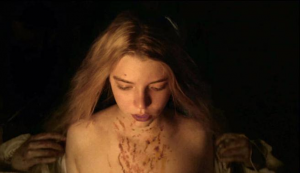 I saw Robert Eggers’s 2015 film The Witch, and let me tell you: it’s a masterpiece. I’m a tough crowd, so that’s a high honor coming from me. I loved the approach that Eggers took in terms of crafting a folk tale from the eyes of the scared participants – a fantastic method that translated well into the paranoid feel of the film. As a good film, this one got me thinking, as good films are wont to do. Particularly about the nature of truth in relationship to godliness. You see, The Witch is highly critical of the hypocritical god-fearer while granting power and survival to the purveyor of truth. The audience has the concept of the imperfect, good Christian introduced from the offset. 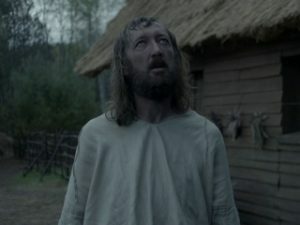 Patriarch William (Ralph Ineson) declares the venture to the New World a bust, and feels that those around him on the plantation are “false Christians.” The result of his hyper-piety is the expulsion of his pregnant wife Katherine (Kate Dickie), daughter Thomasin (Anya Taylor-Joy), son Caleb (Harvey Scrimshaw, who officially has the most epic name I’ve heard in a while), and twins Mercy (Ellie Grainger) and Jonas (Lucas Dawson) into the wilderness. We see them find a place to call home, about a day’s ride away from the small settlement. Flash forward one year later, and the family is displays signs of serious crisis. Caleb is sneaking peeks at his sister’s breasts, hinting that his isolation is bringing him one step closer to good ol’ incestuous ideation. William realizes that the family’s crops won’t last them through the winter, and so he has stolen Katherine’s prized silver cup and sold it in order to buy hunting supplies without her knowledge, lying at several turns by omission. Caleb is clued into this lie, and actively participates in it when he assures his mother that he and his father were out gathering apples for her, as “a surprise., to cheer you.” Twins Mercy and Jonas taunt Thomasin for the disappearance of baby Samuel, who vanished during a game of peek-a-boo. And Katherine? Yeah, she blames the disappearance of her infant on her eldest child, engaging in an ever-escalating campaign against what is essentially a teenage girl who happened to be hanging around when a child abduction occurred. In the throes of severe depression due to the belief that her unbaptised child is in Hell, she screams at her daughter and begs her husband to send her away in a fit of desperation that boarders on a type of jealous rage for the affections of her husband. “We must turn our thoughts towards God, not to ourselves,” William insists to his wife, who isn’t having any of it. She wants to be home in England, and feels all of their travails to be a type of strange punishment for his high moral ground. The grand irony at work here: Thomasin is one of the few agents of truth, which opens up a world of hurt for the characters that are self-serving and dishonest. When William manages to get his family exiled, Thomasin is the one the audience sees praying to god, acknowledging that she is sinful and has broken the Commandments; however, she asks to be the shown “the light,” which her father doesn’t really do in prayer or action. She admits that she’s not perfect, and confesses her fears of being out in the wild. We don’t see this from anyone else; this honesty is particular to her. As time goes on, Thomasin brings the harshness to those who seek to blame her for everything going wrong. The twins accuse her of being at fault for the baby’s disappearance, so she tells them that she is the Witch of the Wood (which, really, does turn out to be true in the end). She gets her brother to tell her what happened with their mother’s missing cup, and after Caleb’s death, she is faced with punishment for attempting to maintain the confidence her brother requested in that knowledge. When pushed, however, she unloads on her father, who was happy to let Katherine think that their daughter had stolen from them: “You are a hypocrite! …You cannot bring the crops to yield, you cannot hunt!” She then proceeds to sell out the twins’ conversations with Black Phillip, which results in their imprisonment in the barn with Black Phillip and the actual witch that has been stalking their family. One might think that this indicates that Thomasin is being punished as well for the events of the film, but one fact remains: her level of honesty is rewarded with survival and power, whereas the pious can only claim painful death. William tells Caleb the truth of their circumstances, but the two work together to deceive Katherine rather than admit an act of dishonesty. Caleb turns to god during his illness, but he dies painfully, and his mother blames his father for the loss: “You’re a liar and you’ve lost another child!” The twins – who delighted in causing mental anguish for their sister and mother alike – are missing at the end of the film, presumably taken by the witch, while William is gored to death by a satanic goat. Katherine refuses to admit that she has falsely blamed her daughter, and instead goes on a rampage that results in Thomasin killing her own mother in self-defense. What does Thomasin receive? A deal with the devil, with the promise of freedom. If you note Black Phillip’s words, he offers her a chance to broaden her horizons: “Wouldst thou like to live deliciously? Wouldst thou like to see the world?” He even helps her sign her name, which she admits she cannot do because, in line with historical accuracy, she is illiterate. Black Phillip is not confining her to the limited world of the farm, as her parents did. She has been the agent of truth when no one else wanted to admit it, and she is granted the ability to levitate and congregate with other like-minded women in return. She’s naked at the end of the film, demonstrating a type of transparency that no one else in the film possessed. In her nakedness, Thomasin truly has nothing to hide and can achieve the ability to soar through the air. It’s enough to make you question piety versus truthfulness: if the good sinner meets painful death and the truthful girl is granted supernatural powers, what does that say about the nature of truth? After all, the so-called good people – the liars, the potential murderers, the semi-incestuous siblings, the taunting children, the raging abusers – are dead while the agent of truth is rewarded. Thomasin gets to live on her own terms, while her family lived and died behind deceit. You have to admit, trading your crappy family for supernatural powers is kind of a sweet deal. The Witch makes us question if knowledge is evil, and more than knowledge, truth. If this is the case, it goes a long way in reminding us of a simple fact of human nature: sometimes, people cannot handle the truth in the midst of a bad situation. Sometimes people will attempt to cover their wrong-doings with deflection and half-truths. And those folks are not rewarded; for them, only greater suffering waits, while the defiant bringer of truth is given the chance to fly. I agree! The Witch was well filmed, well written, and it made you question what evil really is.